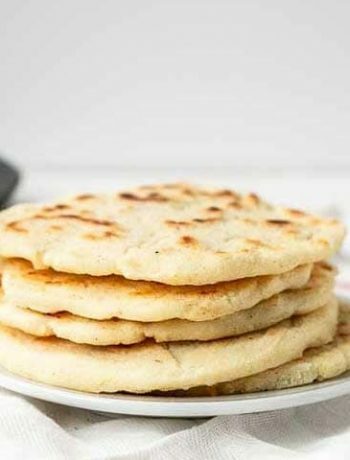 How to make easy yufka Turkish flatbread tortilla. Today we show you that this delightful Turkish flatbread is the irresistible tortilla. Are you ready to learn how to make easy yufka Turkish flatbread? 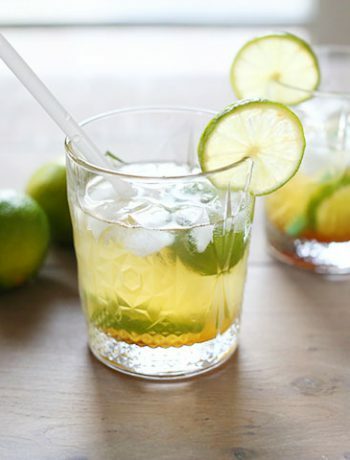 Lets get started! The wrap is so versatile you just have to love it. What make or breaks a tortilla is the elasticity of the dough. If you want soft pliable tortilla you have to have a very elastic dough. Further you need to give the gluten in the flour, time to activate. The only way to do this let the dough rest for some time. Then you need to knead the dough again before you start cooking the tortillas. The second most important thing to consider is the heat for your pan. A good tortilla will puff up in the pan but only if it is hot enough. 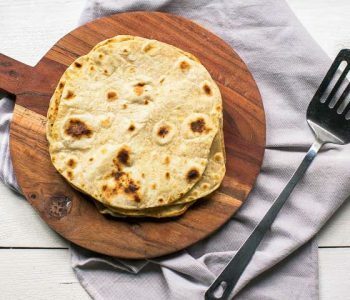 So if you are using a skillet or frying pan make sure the pan is hot enough before you brush some oil in the pan and cook your flatbread tortilla. Yes yufka is that basic and has the same ingredients as the flour tortilla that we know so well from Mexico. You can make the dough by hand or in a food processor. If you make it in the food processor the dough is done in under a minute. By hand will take more time as you have to knead the ingredients into an elastic dough. Start with the flour and salt and let it whisk shortly in the food processor. Then add the olive oil in the flour and turn the food processor on. Pour warm water gradually into the food processor until the flour turns into a ball. Take the dough ball out the food processor onto a floured board and knead it by hand for about 1 minute. Then wrap it in cling film and let it rest at least 30 minutes more if you have time. You can even make the dough the night before and leave it in the refrigerator. Then cut the dough into 6 equal pieces and roll the first piece into a tortilla shape. In the meanwhile heat your skillet and brush it with some vegetable oil. 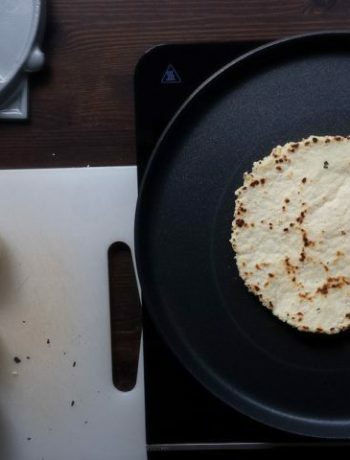 When your pan is hot put the flatbread tortilla in the pan. The tortilla will puff up. Leave for about 1 minute and check to see dark spots on the tortilla. Turn and cook the other side for another minute. Keep warm under a clean kitchen cloth and serve. If you are going to eat the yufka within 24 hours just store them in a zip loc plastic bag at room temperature. Want to store the yufka flatbread tortilla for a longer period put the plastic bag in the freezer. You can store them for at least a month. Reheat the yufka shortly in your skillet to warm them again one by one. You can also wrap the yufkas in some aluminium foil and heat them at 400℉/200℃ for 5 minutes or until warm. 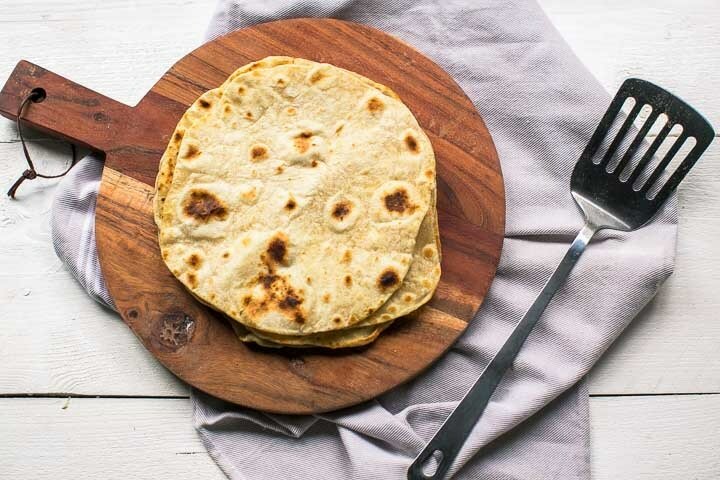 Have fun with this easy how to make yufka Turkish flatbread tortilla flatbread recipe! Made a recipe tag @thetortillachannel on Instagram or PIN on Pinterest. Cut the dough into 6 equal pieces and roll into a tortilla shape. You can even make the dough the night before and leave it in the refrigerator.